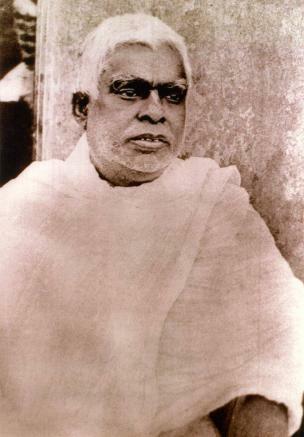 On the eve of the disappearance of Srila Thakura Bhaktivinoda, we present Srila Sridhara Maharaja's composition, 'Sri Bhaktivinoda Viraha-Dvadasakam' (Ten Prayers in Separation of Bhaktivinoda Thakura) Upon reading this prayer, Srila Sarasvati Thakura commented, "Now I am confident that we have one man who is qualified to uphold the standard of our sampradaya." O Bhaktivinoda Thakura! O Gurudeva! Somehow, a long and trying twenty-two years have passed since your disappearance; a time cursed with the painful and heavy burden that I am constantly feeling due to your separation. My life-substance is a prisoner to that agony. The conditioned souls, in due course of accepting unlimited births through countless species, fortunately come to gather the required pious merits to take a human birth on this Earth. But unlike them, you are a personal manifestation of Lord Gauranga’s divine potency, your appearance an evident display of His tender compassion. O, how abominable is my existence! From time immemorial I have been trapped by the warden of impiety. I have no expectation of being afforded a chance of bathing in even one particle of the ecstatic dust of your holy feet. Each shining particle clinging to your lotus feet contains an enormous joyful ocean providing the most ambrosial bath, and promises at last, the fulfilment of my life, the taste of selfless surrender. O, but wait! There is some hope – the extensive all-encompassing magnitude of Sriman Mahaprabhu’s manifest pastimes of wide distribution, audarya-lila, have graced our entire universe. O Srila Bhaktivinoda, you are the personal proprietor and agent of that glorious and gentle grace. O Bhaktivinoda Thakura, you appeared at the hour of our greatest need. At that time, everyone practiced body-worship and flesh-religion, which any honest man will admit is ignorance. The yogis were cheating the public with cheap miracles, exploiting them for money and pleasure. The philosophers, bewildered in trying to capture the infinite, found that their knowledge had led them to the void of nihilism. The mutterers of mantras were working to become well-known japa-chanters. Ascetics practiced murderous torture for spiritual suicide. The proud gave in charity only to secure their fame. And all these abominable acts were performed in the name of anuraga-bhajana, the highest devotion to Godhead. At that dark hour, when all good intelligence had been spoiled by misconception, you were sent by the will of Providence. When he appears within the dark evening sky, the full moon gives life to all the medicinal herbs within the universe by his cooling rays. He also helps the stars to twinkle, and their nectarean pleasure increases as they illuminate the world. O Bhaktivinoda Thakura, you have appeared like the moon to enliven the meaning of the scriptures, which act like medicine to soothe the diseased souls of this world. You advent gives pleasure to the saints, who, like stars helped by the moon, can illuminate others simply by reflecting your light. 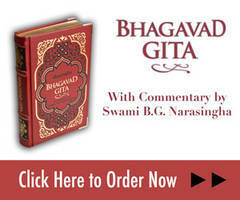 Desiring to benefit the people in general, you preached the Bhagavata principles of devotion. Like the great spiritual geniuses Ramanuja, Madhva, Nimbarka, and Visnu-svami, you composed different scriptures which reveal the divine philosophical vision of the previous acaryas and great devotees. But, O Bhaktivinoda Thakura, O Gurudeva, more than that, you are a vast ocean of divine love, and your magnanimity knows no bounds. The effulgent, non-differentiated aspect of divinity known as Brahman is composed of infinite particles of individual consciousness, and has been considered by the Upanisads and by Vedic scholars to be the halo of the Absolute. The localized plenary portion of Godhead known as Paramatma is sought after by the great yogis practicing extreme penance. Narayana Himself, the predominating Lord of the Vaikuntha planets, whose lotus feet are worshipped and served by His unexcelled beelike devotees, is only a partial representation of the original Personality of Godhead. The original or full-fledged aspect of divinity is Krsna. O Bhaktivinoda Thakura, you have not come to distribute Brahman or Paramatma or even narayana-bhakti, but Svayam-Bhagavan Krsna, the original conception of the Absolute, who is all-ecstasy. It is you, O Gurudeva, who can gently place me in His hands, and you have come to give Him to the public. Within the highest realm of the inconceivable spiritual world, there is a most charming place which is far superior to all others. That place is known as Goloka-Vrndavana. It is there that the original Personality of Godhead Sri Krsna is found. There, Krsna’s transcendental pleasure is increased by the personal service rendered to Him by His devotees who are absorbed in the mellows of friendship and parenthood. There, surrounded by Her most intimate confidential maidservants, Srimati Radharani, with all of Her paraphernalia, is offering Sri Krsna the highest form of affectionate service, which is completely inconceivable on the mundane plane. O Bhaktivinoda Thakura, if you so desire, it is within your power to easily grant this insignificant soul some service within that higher realm. Please bestow that mercy upon me. What was distributed by Rupa and tasted by Raghunatha was protected by Sri Jiva Gosvami, who lent support to its divinity with scriptural evidence. The taste of that divine truth is aspired after by Sri Sukadeva Gosvami, Lord Siva, and Lord Brahma, who regard it with the highest respect from a distance. What is that inconceivable ambrosia? The sublime sweet nectar of the mellows relished in the service of Srimati Radharani’s holy lotus feet. O Bhaktivinoda Thakura, within this world, you fully possess the ability to give us that extraordinary nectar. But where am I! I am in a most fallen condition, my intelligence bound with fault. Where are you, O deliverer of the universe? O master! By your causeless mercy alone, my unlimited offences can be pardoned. O ocean of compassion! O Gurudeva! I humbly be for one favour before your lotus feet: kindly count me as one of the servitors of Sri Sri Radha-Krsna, that Divine Couple who are an ocean of matchless wealth.